The plastic has discolored a little with age, but the yarn colors I've used have been just as pretty as I remembered. The dark blue here is a deep navy and will be the "frame" of a red/white/blue "July 4th bunting" shorty pair. 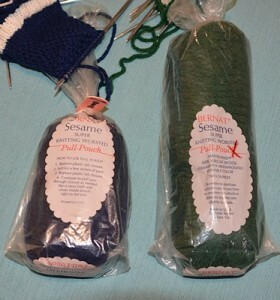 The dark green, on the right, called "Bottle Green" will form the "frame" of another shorty pair, blending a medium soft green, dark lavender rose, butter yellow, and cream. What I mean by frame is the top of the shorty socks (the ribbing stripe is a contrasting color) and heel flap...and the toe. The sock foot may or may not use that color, but the heel and toe always match. Since the stripes are often non-matching between R and L sock, having the top, heel, and toe match "frames" the sock pair. There's a lot of other interesting old yarn I should photograph and show as well. Send a photo to the Bernat people, might remind them to start producing at least the packaging again! Good idea! Thank you; that had not occurred to me. Come to think of it...I could do a yarn-hoarders' filk out of that. "Where has all the storage gone? Long time passing. Where has all the storage gone...long time ago? Gone with yarns of every kind, balls and skeins they've yet to wind...when will they ever learn? ...."Where has all the money gone, long time passing? ...." Etc. Hmmm. May work this up but not today. A friend gave me some Bernat yarn some years ago - Bernat Cassino, which is a double-stranded cotton yarn. I had some in pink, and some in silver, which got used to make a shawl by separating the strands and using it single-ply. That came in the same sort of packaging, a plastic bag with a clip on the neck so the yarn could pull through. Most ingenious!